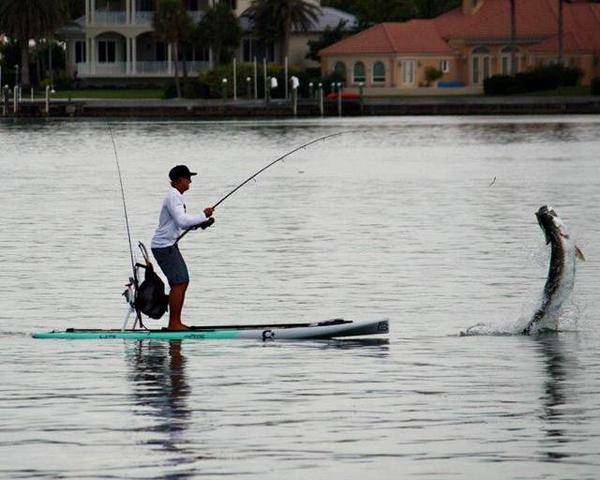 SARASOTA, Fla. — The old adage ‘a picture is worth a thousand words’ holds true for the picture of Nick Halloran fighting a huge tarpon from his paddle board. The young avid fisherman, who lives in Lakewood Ranch, had a summer goal to catch a tarpon from his stand-up paddle board. Last Friday, he headed to a promising spot in Sarasota Bay. “I knew the spot I was fishing held a lot of fish, and right when I got out there I was seeing a lot,” Halloran told ABC 7. He estimates the tarpon was nearly six feet long and it easily pulled him over a mile during the hour and 20 minutes it took to the land the fish. He says after pulling the tarpon next to his paddle board that is designed for fishing, he was able to remove the hook and safely release the fish. But what could have been just another “fish tale” was documented by amateur photographer Roger Ieradi. Ieradi said he getting ready to take some pictures of clouds when Halloran caught his eye. Wanting to give a copy of the photo to the fisherman, Ieradi followed the progress from shore until he could no longer see the fisherman. Ieradi showed Halloran the pictures he took and got his email address so he could share them with the fisherman. “The fact that he went out of his way to track me down to make sure he got my email to get those pictures, I couldn’t thank him enough. He is a great guy for doing that,” said Halloran. Halloran told ABC 7, catching the tarpon from his paddle board was so much fun he can’t wait to do it again.